While it’s not officially Commedia Dell’arte month anywhere else, here on clownlink we’ve declared it officially commedia dell’arte month! This is in honor of the second annual International Commedia Dell’arte Day, which will happen on February 25 this year. In honor of that day, each day this month, we’ll present a link of some sort to something commedia related. We covered the first annual International Commedia dell’Arte Day last year. The new holiday is celebrated every year on February 25, and is proclaimed by the Italian cultural association SAT as an action of the incommedia.it project in support of SAT’s appeal to the nation of Italy and to the United Nations (UNESCO) to recognize Commedia dell’Arte as an official piece of “Intangible Cultural Heritage“. Worldwide Commedia dell’Arte Day events are coordinated by Faction of Fools. To find out what events are going on for ICD, (or to start an event of your own) visit http://www.commediadellarteday.org/. 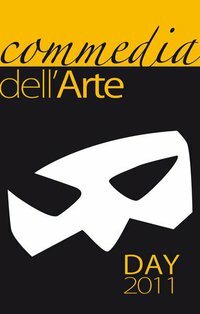 You can also follow International Commedia Dell’arte Day (ICD) on Facebook . It’s Worldwide Commedia Dell’arte Day! 10 ways to add some Commedia to your life!